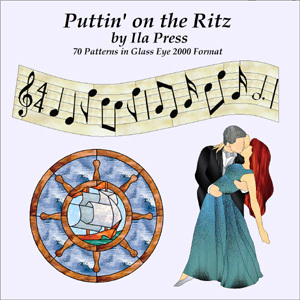 Puttin' on the Ritz is an eclectic collection of 70 stained glass patterns including panels, fan lamps, and suncatchers that range from the traditional to the contemporary. Many of the patterns lend themselves both to conventional stained glass work and to mosaics. The patterns in this collection include geometrics, abstracts, Celtic knots, people, animals, still lives, florals, Egyptian designs, art deco, Victorian, fantasy, Judaica, Gothic and much more!